7th. Our forces advance again to day as far as the bridge in front of Mcnutts hill. they return 3 miles and go into camp. The next day they (Rebels) were encountered and fought well for a while but a bayonet charge started them and they didn't stop to show much fight until they reached what was called the Twelve Mile Bridge. The rebs held their ground obstinately and the firing grew terrific. A vigorous forward movement by our troops however made them get out and kept them on the move until they reached McIntosh Hill the writer may have meant McNutt's Hill), where our force abandoned pursuit and bivouacked in line. In the evening, about dusk, the pickets discovered some one prowling near the line. Coming a little too close, a shot from one of our men laid him out. The body was brought in and examined. It proved to be a Major McNeil, a chief of staff. Official papers were found about him showing that they understood our situation perfectly. 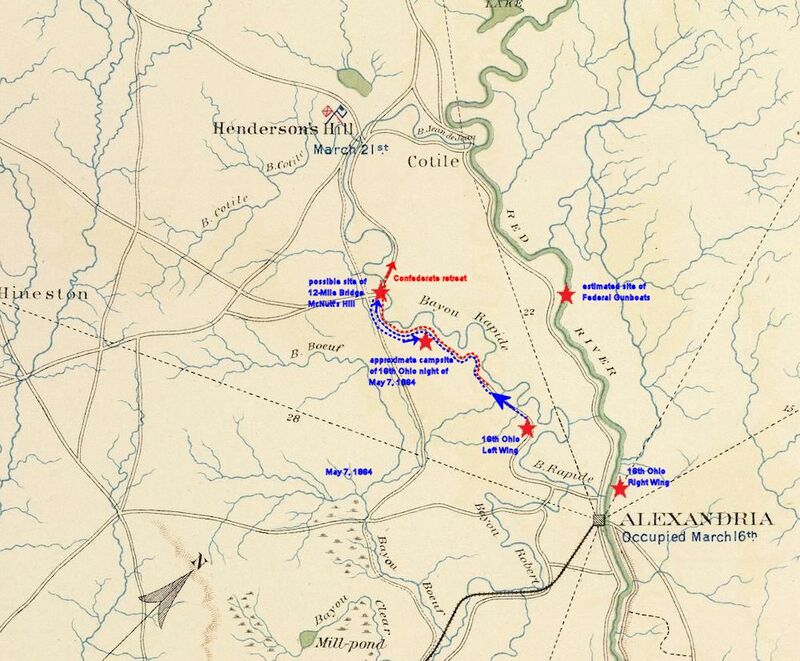 The vim with which Lawler went for the rebs changed the seriousness of our situation at Alexandria very soon. From bold and threatening movements toward our camps they subsided to the sneaking warfare of the guerilla, attacking our foraging parties, creeping up and shooting at the pickets and annoying boats along the narrow river. Some of the gunboats ran short of fuel and were obliged to put men ashore to cut wood. The rebels bothered these fellows very much in the absence of our infantry. This period military map is annotated with the estimated route taken by the 16th Ohio (and other units) on May 7, 1864, when they marched against Rebel troops north and west of Alexandria, Louisiana. The points shown (red stars) are notional but believed to be a good approximation of the location of the 16th Ohio on this day. 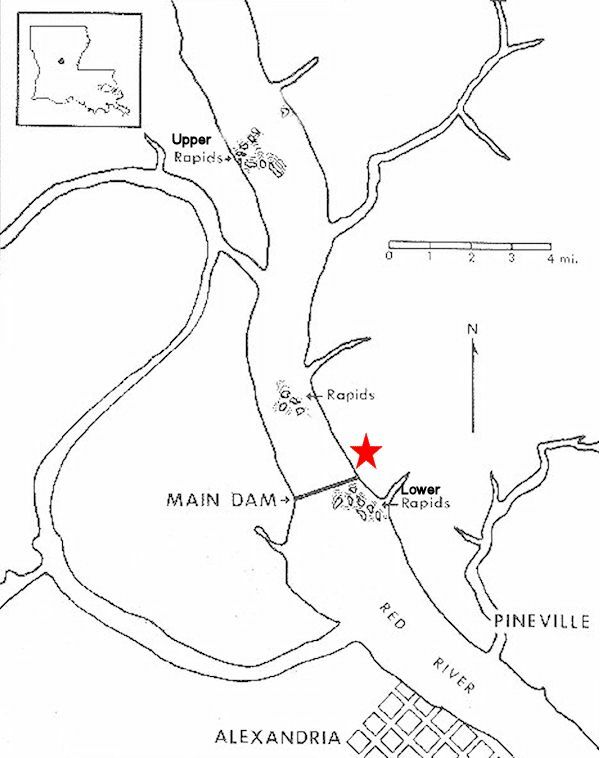 In summary, Union troops advanced along Bayou Rapides about seven miles, driving the Rebels, who had been encroaching on Alexandria, across the bayou.It is assumed the point at which the Rebels crossed the bayou was at 12-mile bridge, near McNutt's hill. The 16th Ohio and Union forces then withdrew about three miles back down the road and camped for the night.